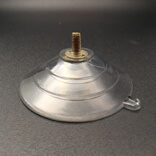 Large suction cups with screw. 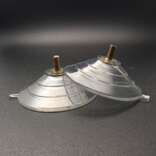 Large suction cups with screw. 60mm diameter. Suction cups are a cup-shaped device which is used for sucking purpose and is applied to a surface. When it is used in a surface it creates a kind of biased void on that surface. These suction cups are used in many areas. 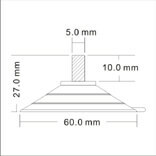 Suction cup-Screw and Nut 60M5-10 is made with a flexible material. Usually, these suction cups are made in different forms. 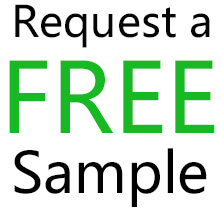 This can be used for any sucker purpose by the people. It can be available in small and large size along with hooks like large suction cups with hooks, wall suction cups and vacuum suction hooks. It is a form of sucker tool which is used in the non-porous flat surface. This suction cup product is best suited for powerful sucker needs. 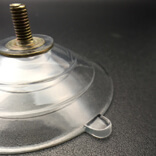 The main advantage of using this suction cup material is, it can be easily removed and reused. The screw in this cup is used to adjust the cup and the nut is used to fix on the surface. Users can also get this suction hook for the affordable cost. This product is unique in its feature. This suction cup will fulfil the sucker need of the user in a greater manner. Also, users feel easy to handle this suction cup.